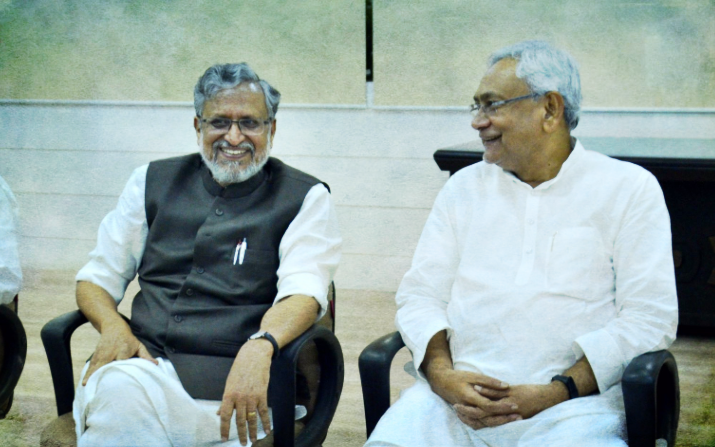 In less than 24 hours, Nitish has returned as Bihar's chief minister, rekindling an old alliance with the BJP. New Delhi: In less than 24 hours, Nitish Kumar has returned as Bihar’s chief minister, rekindling an old alliance with the BJP. Nitish was sworn in at 10 am at Raj Bhavan in Patna by governor Keshari Nath Tripathi. Senior BJP leader in Bihar Sushil Modi has been sworn in as deputy chief minister. He has previously served as Nitish’s deputy from 2005-2013. The JD(U) has 71 lawmakers in the 243-member state assembly. With the BJP’s support, Nitish’s party now has 124 – one over the halfway mark. A floor test is scheduled to be held on Saturday, July 29. The “decision to form new government taken in the interest of Bihar, we will take the state to the path of prosperity,” Nitish said after he was sworn in on Thursday. Prime Minister Narendra Modi tweeted congratulating both Nitish and Sushil. Congratulations to @NitishKumar ji & @SushilModi ji. Looking forward to working together for Bihar’s progress & prosperity. Former deputy chief minister and Lalu Prasad Yadav’s son Tejashwi Yadav met state governor Keshri Nath Tripathi on Thursday morning, echoing Gandhi’s view that this decision was part of a longer plan. He registered protest that the RJD – the single-largest party in the Bihar assembly – had not been invited to form the government. “RJD being the single largest party should have been invited to form the government. We are taking legal advice and will move court against the governor’s decision,” he told reporters after the meeting. He said the people of Bihar had given the grand alliance the mandate to run its government for 5 years which Nitish “betrayed”. Nitish had tendered his resignation last evening after RJD chief Lalu had insisted his son Tejashwi would not resign as the deputy chief minister over alleged corruption charges. The CBI had filed a FIR against Tejashwi, naming him as an accused in the land-for-hotels corruption case. Nitish’s resignation as the chief minister of Bihar has drawn the curtain on the two-year-long mahagathbandhan between the JD(U), RJD and the Congress. Soon after resigning, the prime minister had tweeted congratulating Nitish on “joining the fighting against corruption.” Nitish was quick to respond and thank the prime minister. After tendering his resignation last night, Nitish said he had made the decision in the interest of Bihar. He further added that he had not demanded anybody’s resignation but wanted Lalu Prasad and Tejashwi to come clean on the allegations leveled against them by the CBI. “Situation was becoming increasingly difficult for me to continue. We spoke to Rahul Gandhi, but nothing worked out,” Nitish said. Nitish’s JD(U) party was a NDA member during the Vajpayee years, with the JD(U)-BJP running an alliance government in Bihar form 2005 to 2013. 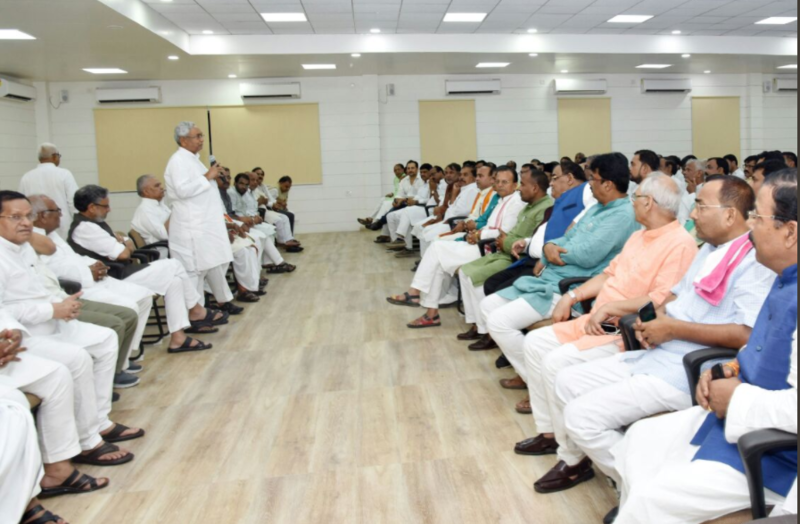 Nitish had split with the NDA at that time over the BJP’s decision to field Narendra Modi as its prime ministerial candidate in the 2014 Lok Sabha polls.